with: Han Bennink, pizza box, giant bass autoharp,drum set; Eugene Chadbourne, National dobro, Communist 5 string banjo: Whisky and women, duet for giant bass autoharp and Communist banjo (08.15); Han Bennink and Eugene Chadbourne (05.13). Recorded in various Dutch locations, 1990. Derek Bailey, guitar and comments; Eugene Chadbourne, Deering 5 string banjo and electric rake: In search of Carl LaFong (08.05); Raking a chance on love (01.47). Recorded in Den Haag, 1995. Charles Tyler, baritone saxophone, Bb clarinet; Eugene Chadbourne, guitar: In between comme C and come saw (13.18). Recorded in New York City, 1977. 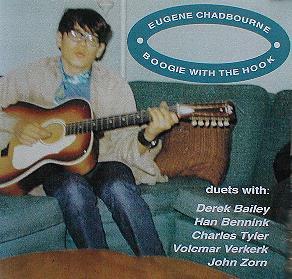 Volcmar Verkerk and Eugene Chadbourne, Deering 5 string and long neck banjos, Korean banjo: The banjo duet (14.37). Recorded in Amsterdam, 1996. John Zorn, alto and soprano saxophones, Bb clarinet, game calls; Eugene Chadbourne, guitars and personal effects: Red lightning part 1 (17.16). Total time 69'06. Recorded in New York City, 1980. Design (front cover reproduced above) by Eugene Chadbourne.